HONG KONG, Mar, 28 2019 - (ACN Newswire) - Start-up Express, a development programme launched by the Hong Kong Trade Development Council (HKTDC) in 2018, is set to return for a second time to assist local start-ups in building networks, marketing their business and enhancing brand awareness. Each of the 10 companies selected through a pitching competition is entitled to join power meet-up sessions with successful business leaders, visit a high-potential start-up hub as part of an exploratory mission, and engage in marketing and trade promotions in Hong Kong and overseas. 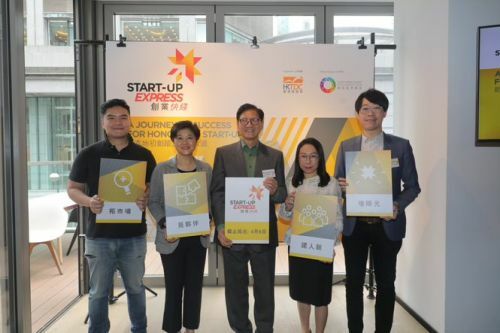 "Start-ups are a powerful growth engine for the economy, and the HKTDC is committed to supporting them and helping to take their businesses to the next level," said Raymond Yip, HKTDC Deputy Executive Director. "In 2018, Start-up Express received high praise and strong support from the community. Some of our winners even won creative awards at international exhibitions, and went on to pursue new markets in the United States, Europe and Japan, which in turn helped to attract new investors and partners. This year, we aim to offer more start-ups the chance to step into international markets through a series of curated activities and workshops that will form a key component of Start-up Express 2019." - Resource Platform: Become an alumnus of the HK Startup Society and enjoy access to the platform's resources and benefits for elite start-up founders or co-founders. Start-ups that have been established for less than five years, that have their core or substantial operations in Hong Kong, and have raised less than US$10 million in funding, are eligible to join Start-up Express. Applications close on 8 April. Please visit: http://info.hktdc.com/startupexpress/en/index.html for details. A total of 40 start-ups will be shortlisted for a closed-door pitching session, with 20 finalists selected to join the Pitching Contest during the HKTDC Entrepreneur Day on 17 May. A total of 10 winning start-ups will be chosen. The Our Hong Kong Foundation (OHKF) is the official partner of Start-up Express. OHKF Assistant Executive Director Louisa Lui said: "In a competitive global landscape, innovation has increasingly become the driver of economic development. Start-up Express supports Hong Kong startups to give full play to their advantages and help to promote Hong Kong as an international innovation centre." The 10 top-performing start-ups will enjoy a series of power meet-ups, study missions and the opportunity to take part in trade promotions, including exhibitions and conferences organised by the HKTDC that have a dedicated start-up zone such as the Asian Financial Forum, Hong Kong Electronics Fair (Spring & Autumn edition), and Hong Kong International Medical and Healthcare Fair. They can also join HKTDC overseas flagship events such as the Think Asia, Think Hong Kong mega event that will take place in Los Angeles in the US later in 2019. In addition, winning start-ups will also have the opportunity to join the Hong Kong Pavilion at international exhibitions such as the Consumer Electronics Show (CES) in Las Vegas, USA and the Mobile World Congress (MWC) in Barcelona, Spain, to gain first-hand market information. "Start-up Express is like an express railway for business development. It helps start-ups quickly penetrate the real world of business, build global business connections and enjoy extensive publicity by participating in world-class events. Local start-ups can network and learn from entrepreneurs from across the globe," said Mr Yip. Representatives from the winning start-ups in the inaugural Start-up Express, including Toby So, founder of Film Players Limited, Jordan Cheng, founder and CEO of MAD Gaze, and Rain Lee, CEO of RainsOptics Limited, attended a press event today to share their experiences taking part in the programme, learning from business leaders and exploring different markets. They also discussed the advantages local start-ups enjoy in Hong Kong, across Mainland China and in overseas markets. Film Players Limited has developed Smart Film, a flexible film that can also be cut like a piece of plastic. When applied to glass or any other surface, the film transforms that surface into a "smart glass" using a mobile application (app) or sensor. In November last year, the company participated in Think Global, Think Hong Kong, a large-scale promotional campaign in Tokyo, Japan, organised by the HKTDC. They also joined the Hong Kong Technology Pavilion at MWC Barcelona, the world's largest exhibition for the mobile industry. "We met a number of clients from Japan and Europe at these exhibitions, including internationally renowned construction and transportation companies," said company founder Toby So. He believes that European and Asian markets are actively looking for smart city solutions, opening up new opportunities for Hong Kong-based start-ups. Mr So said that taking part in trade exhibitions can be of significant benefit to local start-ups looking to build a stronger, more diverse network. Another of the last year's winning companies, MAD Gaze, developed innovative augmented reality (AR) glasses three years ago. Since then, the product has been able to stand out from competitors with its multi-functional system and cost-effective sales model, becoming one of the world's top three smart-glasses brands. During a meeting arranged through the HKTDC with Antony Leung, Group Chairman and CEO of Nan Fung Group and a judge at Start-up Express 2018, Jordan Cheng, founder and CEO of MAD Gaze, was advised on how crucial it was for the brand to constantly seek breakthroughs in order to enhance the company's competitiveness. He said that Hong Kong's talented IT community has forward-thinking vision and a pool of innovative ideas, which have helped his company gain a strong foothold in the international market. A third winner from the 2018 programme, RainOptics, developed OphthoLens, a pocket-sized adaptor lens that becomes a high-quality fundus camera when connected to a smartphone, helping detect eye diseases through retina imaging captured by the lens. The company is currently developing an artificial intelligence platform to allow doctors to carry out real-time diagnosis. RainOptics CEO Rain Lee said the company gained useful exposure by participating in the Hong Kong International Medical and Healthcare Fair organised by the HKTDC, with orders received from clients in Mainland China, India and the Philippines even before mass production has begun. Through Start-up Express, Ms Lee visited the cities of Nanshan and Dongguan in Guangdong province, giving her a better understanding of the business environment and the potential of the Guangdong-Hong Kong-Macao Greater Bay Area. Raymond Yip said that Hong Kong is a vibrant hub where start-ups can tap into extensive expertise and experience across different industries, in addition to well-connected networks that have been enhanced following the opening of the Hong Kong-Zhuhai-Macao Bridge and the Hong Kong section of the Guangzhou-Shenzhen-Hong Kong Express Rail Link. The development of the Greater Bay Area will see the opening up of new opportunities for Hong Kong businesses, particularly in the area of innovation and technology. "Through Start-up Express and Entrepreneur Day, as well as our exhibitions and overseas business missions, the HKTDC empowers start-ups by giving them the opportunity to connect with investors, buyers and potential business partners in the Greater Bay Area, enabling them to pursue competitive development opportunities," Mr Yip said. 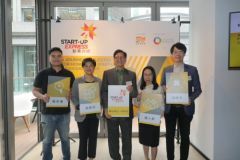 A press conference today, organised by the HKTDC, introduced the 2019 Start-up Express development programme and featured some of the winners from the 2018 event. Pictured (L-R) are Toby So, founder of Film Players Limited; Louisa Lui; Deputy Executive Director of the Our Hong Kong Foundation (OHKF); Raymond Yip, Deputy Executive Director, HKTDC; Rain Lee, CEO of RainsOptics Limited; and Jordan Cheng, founder and CEO of MAD Gaze. The OHKF is the official partner of Start-up Express.